Generating an online statement from LIC Housing Finance Ltd is very easy, simply follow the below steps to create an online account with LICHFL and generate statements online! You may use the online generated statement as a proof for principal paid for a housing loan(under section 80C) and interest paid(under section 24) while filing income tax returns. * Want to know how to save maximum income tax? Read our most read article how to save maximum income tax (opens in new tab). * Paying high interest to LICHFL? Learn how to reduce interest on your existing home loan (opens in new tab). Visit LICHFL website and click on the 'New Customers? Click Here' link(refer the below screenshot). Go to LICHFL website and click on the Login button. Enter your username and password and click the Submit button. 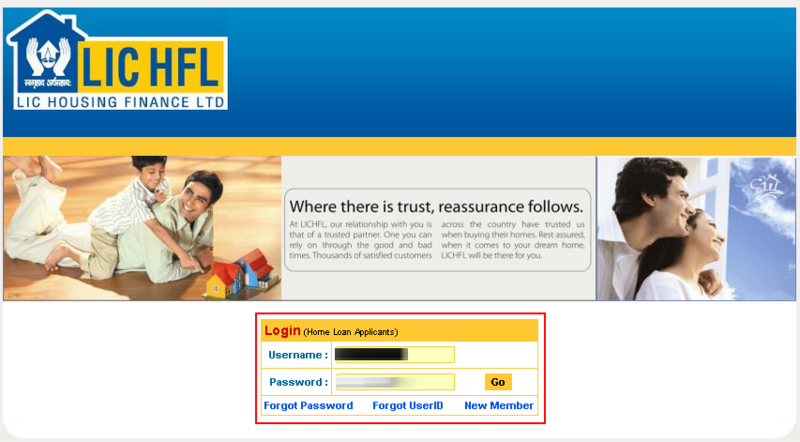 On successful login you can see your personal details and the linked home loan account details. To see your loan status report, click on the 'Loan Status Report' on the left menu, select the loan number and then click the Go button. You can generate repayment certificates for income tax proof by going to 'Repay Certificates' link on the left. Select the loan number and the finacial year for which the report should be generated. On clicking on 'Go', the statement will be generated in pdf format. LICHFL has not yet announced any online payment facility to re-pay housing loan EMIs or pre-payments. Forgot LICHFL Username or Password? Don't worry, visit forgot LICHFL username or forgot LICHFL password link to retrieve your username and/or password. You may try the below link if none of the above method works. Make sure to select 'Already availed Loan' for 'If New Applicant' and fill in 'Loan Number' and select 'Area Office from where loan availed'. Also you may email your Loan details to Email LICHFL. Also read Gold Loan Vs Personal Loan. Update: From this year onwards PAN number of the financial institution from where you have availed housing loan is mandatory to get tax benefits from housing loan. You can find PAN number of LICHFL here. I some time before used this facility which was good experience. But recently i lost both password and user id hence i am unable use this facility no more. Website lacks facility for resetting the password or user name. in-case of such problem whom to contact that details are not available at all. how to reset email address if we forgot password or user id, pls mail me to shanthipriya16@gmail.com i could not login without that. 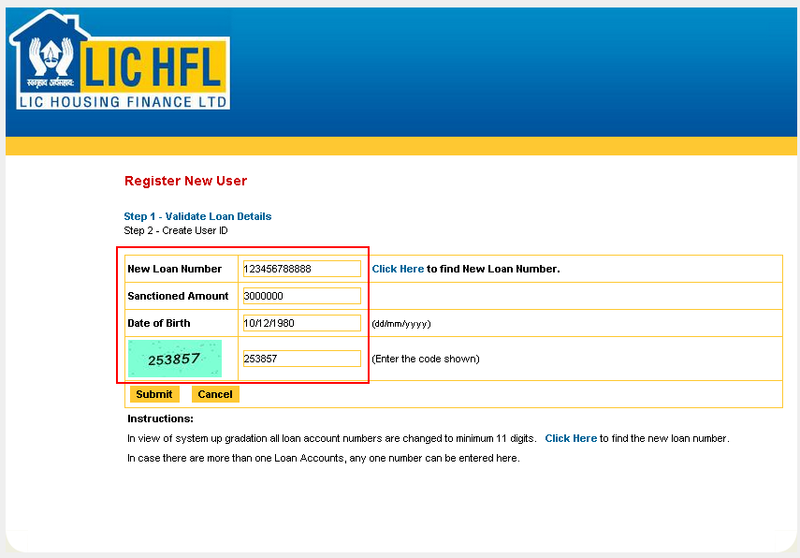 Its not recognizing the new loan acc number which ws issued by LICHFL. MERA LOAN A/C NO.13050102599 KA PASSWORD NAHI MELRAHA HAI DOWARA SE PASSWORD KAISE MIL SAKEGA .KREPAYA MARG DARSIT KARNE KASTH KARE. and provide your username, loan account number and date of birth. You will get an email with the details. The New Number can be arrived at prefixing 2 digits to the earlier loan number. Can you please give the number for Indore? I have only my loan a/c no. with me and have forgotton the username and password.Pl find me a way to find me the statement of the loan status. Anyidea when they are going to introduce Online pre-payment option. We have taken a joint housing loan. Whenever we generate the loan statements online it is getting generated in my Husband's name only. How can we get the same in the name of both of us? What is the current home loan rate of LICHFL? @Vani, there are different loan schemes available with LICHFL. Interest rate is decided based on the loan amount and fixed/floating option you choose. Currently for loan up to 30L attracts 10.75% interest for 2 years and then the prevailing floating rate. Contact your nearest LICHFL office for all the schemes available. In your loan sanction letter you will see only file number. Call your LICHFL branch and give your file number, the branch will provide the loan account number. Also you may request an account statement, which will have your loan account number. LICHFL website when tried to recover username is suggesting no-email id registered. How to get out of this as there is on customer support to call them and get it sorted. My loan account no is 12 digit. When I register as a new member it is asking to enter the loan account no as maximum 9 digit. Due to this I am not able to register online. My area is Bangalore. Can some body help me to register in LICHFL ? Trying to contact the LICHFL office, Hayes Road, Bangalore from today morning. All lines are ringing but no one is attending the phone. Can somebody respond to phone calls? The online way sounds good. I have been trying for past one week to take details related to my account. I was unable to get those.. site keep giving me error. i m trying to create new user account for generating online statements for housing loan,but the message appearing in background is as "under construction". Is there any alternative way to get the same? I could not able to access LIC wesite. Could you please let me know,if anybody have information for same. hi. 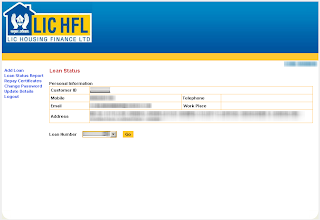 I have tried the above steps to register and view my LIC HFL loan statements online. However, I am getting the message "Site under construction". Please I need the loan's annual statements for accounts" 64203932 & 6420 3587 immediately as i need to file it for the year 2012. Pls advise if these can me emailed to me. Whom do i contact? You may visit your LICHFL branch for the income tax statement. While processing the online registration process,After completing step 3(giving personal details) activation mail is not coming to my mail id.How to change mailId.I tried from 2 step ..giving loan details once again ..but it saying long id is loan number is already register...please help to get out this situation. any support number is there..
LICHFL Customer Portal is back! LIC Housing Finance is inviting applications for the post of Assistants for the year 2013, visit website for details. Hi I have account 12 account number but am not able to register and login . Can you kinldy help me . I gave my Account number , Sanction Amount , date of birth am dgetting in valid details . Please guilde me ti complete the registeration . Hi, My account number is 10 of 10 digits and unable to register. it throws simply, "in valid details". it does not tell which detail is wrong. i am unable to generate new loan number form, there it allows to enter 9 digit loan number. at last i had head ache with this portal site. hi i tried to register with 12 digit loan account number but confirmation email has not come to my inbox.please can any one suggest what to do next. I'm unable to register. My loan no (21)240038895. Can you help me? My Loan num : 17063771, I am unable to login the lic housing finance site to generate the loan statement, can u pls guide me how to proceed further..
Can you help me in getting the provisonal certificate for the home loan ? If you can give me the exact url and steps to get the certificate, It would be really great. (1) Loan Status (a summary of senctioned amount/date with current years Primcipal and interest paid). (2) Loan payment certificate (FOR ITR declaration). Where as, a Loan Repayment statement is Amortization Sheet between 2 dates that gives a ledger with opening balance, EMI amount, interest, principal and closing balance for all monthes between 2 dates. This statement is not available in LICHFL website. However such statement is available in the websites of leading banks like HDFC, ICICI, etc. Please let me know if this statement is downloadable online. why there is no response from your end on the single question posted by several users? This is sandeep frm Varanasi,I created a login in the lichfl.com website.It worked properly for some time,After some days ,when i tried to login,I cannt able to login,when i used forget user id/Forgot password.It showing the error,Email -id is not registered with lichfl.com.Help me n solve my issue. This question has been posted my many people but no answer founf in this post, hence sending again. I have registered to this facility but the data is refreshing twice in a month to knew the latest balance esp. when I make prepayments. What is the defined frequency of data updates ? I have a 12 digit account number. But I am unable to register. It keeps throwing invalid details error. I will not let me prefix any numbers based on city as max limit is 12 digits for the text box. The details are valid and I am sure of it, because when I go to the office to drop a cheque, there are no issues. 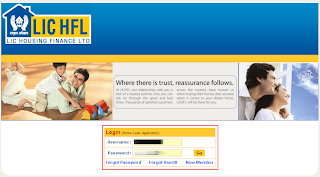 I am facing the same issue similar to many other users...cannot login into LIC Online Portal as well as cannot retrieve Password since it throws error - "Email is not registered with LICHFL". Please suggest/help with a solution. Very usefule post. Thanks for putting all these details. Appreciate your efforts! Thanks. Very useful post ! How can I get the disbursement details / Account statements online? I don't see any option. I forgot LICHFL userid and password, while trying to get it, i am receiving an error of "Email Not Registered". I called several times the local lichfl office to add my email id to my loan account. But still getting the error. Email id Not registered error message i am getting it while trying to use the Forgot password link. 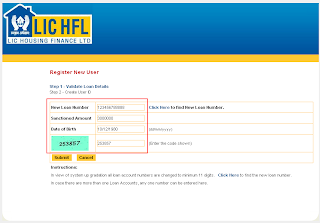 Could you please help to find out the alternate way to get/activate the user account in LIC HFL. Hi, i have took a HOME loan and i have all the details with me. i registered my loan via LICHFL website. I forgot my username and password. now when i try using the forgot password or forgot username options i am getting the below error. - Email is not registered with LICHFL for forgot user id. - Userid/LoanNo/DOB doesn't exists for forgot password. We husband and wife jointly took loan from LIC HFL. My application number is 5104004098. First installment(Part) @ Rs.12729/- has been paid through ECS 0n today. I would like to get statement for IT purpose up to 31/3/2014. What is my loan account No. and what is the procedure to get the statement for IT purpose please. @Ashok, go to any LICHFL branch and ask for a "provisional" statement for income tax purpose. You need to give your file number or loan account number. Hello Sir, first of all this post is very useful. Then my question is, I have given loan account number, sanction amount,date of birth and security code, but the registration page popup the "Invalid details." Error Message. Could you please help me how to resolve this. Thanks Siva. iam repeatedly getting message as 'Error occured we cannot process your request at this movement' when iam trying to create user id and pass word.Can you pl help to resolve this. I am also getting the same error as described in previous message @ 11:13 AM 14-Jan-2014. Any resolutions so far ? I called up LIC-HFL service numbers, but call were not picked up. Thanks for the info, but the LIC site doesn't look stable. I'm trying to generate repay certificate but it always throws an error. "Sorry, an error has occured and we cannot process your request at this moment. Please try after sometime. " Is there any timing constraint or do we need to use any particular browser ? I have closed the home loan from LICHF and transfered to other bank. I am not able to login now on LICHF on-line gateway. In this case how I can get income tax certificate from LICHF for the relevant period of financial year. Could you please help in this case? Thank a lot, it worked perfectly! Thanks alot, very helpful site. Thanks for the article, its very helpful. But LIC website is very poor. I am not able to register even after multiple attempts, from different systems and locations. Every click of button spins the page for ever. When loads, it throws error - "Sorry, an error has occured and we cannot process your request at this moment. Please try after sometime." Thanks for useful guideline,I have taken housing loan from LIC HFL in 2009 at floating interest rate present ROI shown @12% where as present ROI is 10.75% why LIC HFL charging 12% from me ? Where as all leading Banks resetting the ROI in presenting rate, How can I reset my loan ac ROI in present rate? why income tax certificate from LICHFL not provided online? where as other bank providing the same online and on the other hand LIC himself is providing the same on online.It require improvement. How can I change my EMI date from 1st to 10th ? When I am trying to register as new user, it is throwing an error as "Invalid Details". What do we need to do to get this issue fixed? Article was very helpful. Downloaded the loan status. I tried to download the repay statement several times, but in vain. I know my loan account number but I did not remember the loan sanctioned amount. 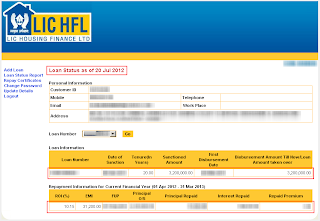 How can I know my loan sanctioned amount? How can I register without loan sanctioned amount. It will be there in your loan sanction letter. Or just call your branch and provide your account number/file number. You have provided good steps. Is there a way to repay LIC home loan via online payment? I would just like to tell that I really liked your blog post. In fact I am going to bookmark your blog and will regularly visit the site. You come up with such an amazing articles thank you for sharing this your site. 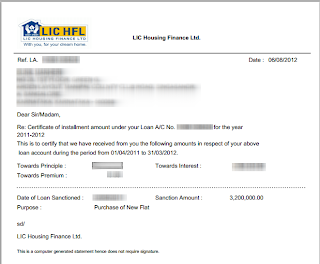 I have taken housing loan from LIC in 2014. After checking my profile online, i could find some discrepancies in my address.Could you please suggest how to get it corrected. Actual repay certificate is not available online. Why is this delay by LICHFL ? If this is for income-tax filing, actual repay certificate is not necessary, you can submit provisional certificate. how to find account or loan number with the help of application number? Contact your home branch and provide your file number. Thanks for very detailed explanation. Provide the file number to your branch office, they will help you find the account number. Also it will be there in the provisional certificate if you have one with you. You need to get the new loan number from your branch. 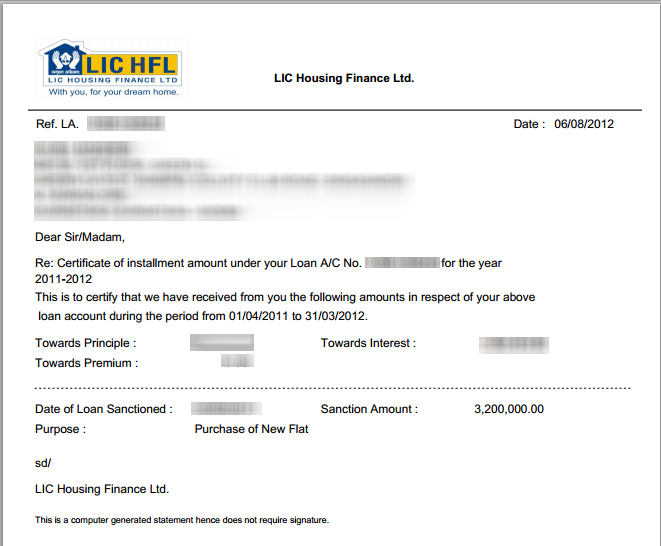 I have taken loan from lic in October 2010 amounts Rs.1200000/- and now I want to pay some part of it. I want to ask is there any profit with it. Of course, you don't have to pay interest for the amount you are repaying. Say you paid 2L out of 12L loan, next month onwards the interest will be charged only for 10L, thus your repayment period will come down(say from 20 years to 18 years). Also you can ask the bank manager to reduce your EMI instead of tenure. I have been trying to create a new user in the website, even after providing the correct info, it is simply throwing invalid details. How can i get past that? is there someone/group who can help me creating the new user info. I have created an online login for my Housing loan. However I am not able to see the detailed statement online. I do see the options you have explained above, but i am looking for detailed transactions for the monthly payments, please let me know how can i get them online. I forgot my UserID and have used the option of "Forgot UserID" and entered my loan No and DOB, and I got the message credential sent to your email Id but haven't received on email. How can i generate loan statements online? I too require the loan statement online. Any help? 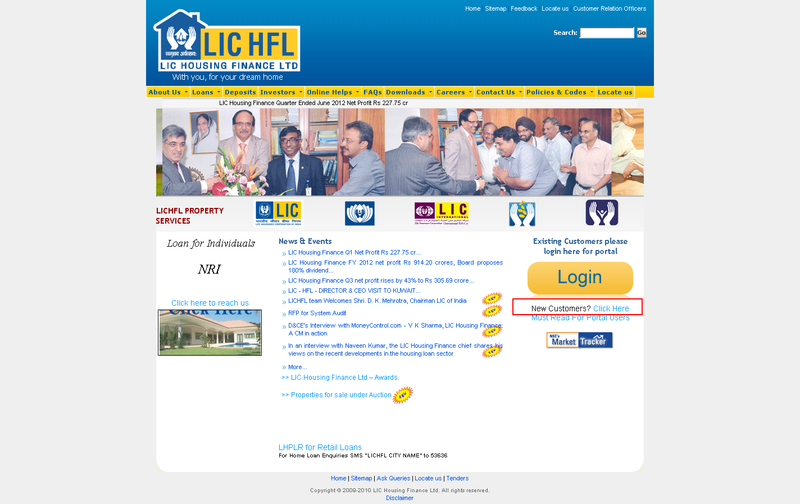 I see Lic provides limited online services. Is there a way I know when is my loan ending? Last EMI of the loan? Please advice me what can be followed for registration. Is there any way to get monthwise deduction details in LICHFL online? sir what are the procedure for deposit the on-line LICHFL homeloan. 5. Selected my loan account number and financial year as 2015-2016 and clicked "Ok"
The site is still down! Is there any problem with the generation of New password, It just shows new password emailed to you, but we are not receiving any mail from LICHFL. Wait for few minutes, also check spam folder. For My LIC Home Loan Account some 1 phone no and mail id is assigned. very bad experience. My concern is how you people are approving loans, from my present mail id confirmation. which is not in your records. LIC Management please take right steps. My Id is : therathna@gmail.com. 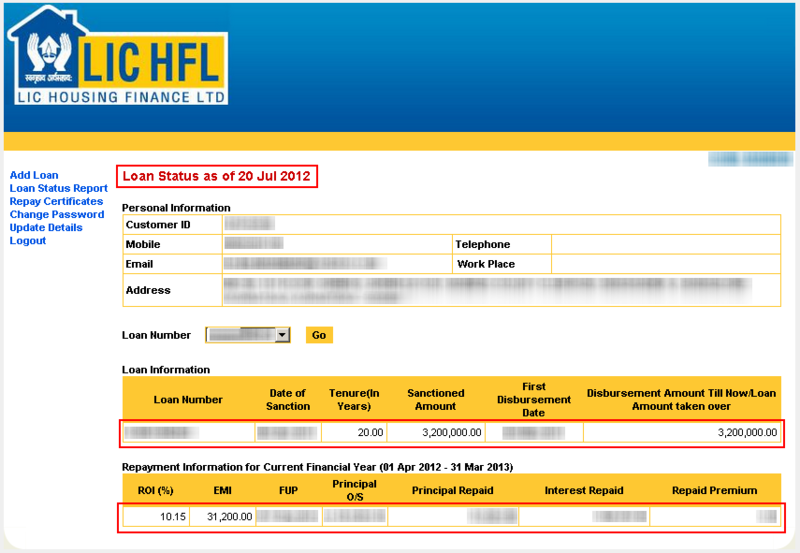 hi ....i took loan from lichf delhi branch of 38.50lac 2 months before under pure floating rate @9.95.now i want to do some prepayment/partpayment but my area manager is refusing to take the the cheque,he said i have to pay 6months interst because all floating rate scheme has 6 months locking period although before taking the loan he keep assuring me thar under floating rate i can do prepayment any time becoz of rbi guidelines no prepayment charges on floating rate. in addition to this before taking the loan amount i told him that i will do prepayment after 2 months and he assured me no charges will take on floating rate. i took loan on floating rate instead of fixed rate becoz of this reason, now he is refusing to take the prepayment cheque.....i wish to know that it is legal to do like this? is it right that we have to pay 6 month interest on floating rate. 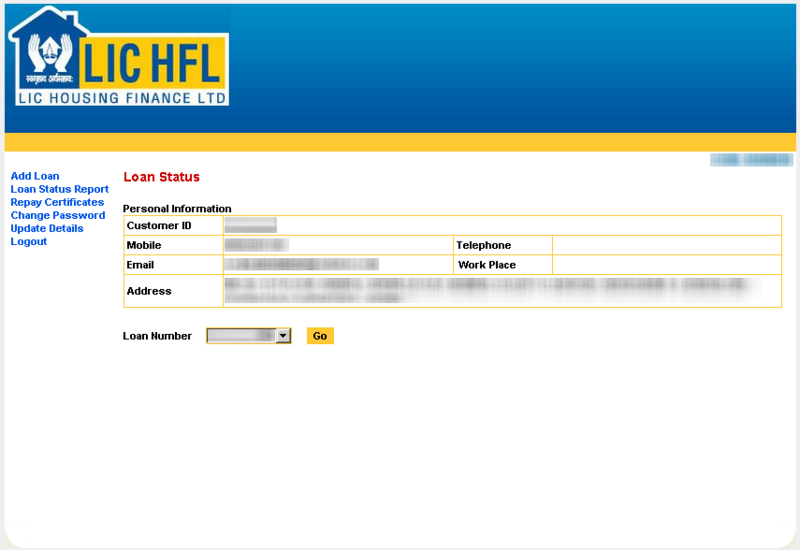 Hi... Website address has changed and in new website i am unable to locate tab from where i can retrive loan statements. Primary applicant, normally from whom the EMI will be collected. I wanted to see the total amount repaid till date. But the loan status report shows only loan amount taken and repaid amount for the current financial year. How to get the report of total amount repaid till date ? There are few options under "Activities" menu like "Repayment Schedule", "Repayment Ledger" etc. providing check no. they are not giving original check. I am trying to get my repay certificate for the financial year 2016-17 from LICHFL website but it doesn't work. Any pointers? I am not able to register even after providing correct details like loan account number, Sanctioned amount, date of birth and security code. Every time it says ' Invalid loan account details. ' Can you please advise? If you have co-applicant, try with their birth date. This is the worst site I have ever tried to register. Not able to even register for my loan account. Please let me know the option to update the Mobile number so that i can complete the password reset and login to my account. I have an account from LICHFL from 2010. The account has 8 digit. When i try to get my online statement using that , I am getting a message stating that account should have 11 or 12 digits. In this same page above, I have seen that we should add the area code before the account number. But still the account number will only have 10 digits. Please help me what to do. Now I got the account number by looking at the bank statement. When I tried to login, it says user already exists. I have never logged into the system before. Looks like something is fishy. How can I change the username, password, email and the linked telephone number? I am staying outside of India for the past 7 years. I want to link my abroad number to this account.